Vid2Pix is a free Windows 8 app available under “Music & Video” category of its App Store. 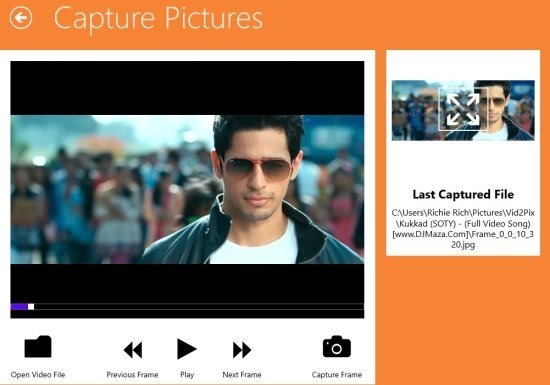 This free Windows 8 Vid2Pix app lets you capture images from videos on Windows 8 PC. Many a times it happens that we wish to capture any scene and would like to view it as image. This Windows 8 app makes it easy for you to capture any scene from playing video and convert the same in image format. You can then view the scene captured as image on your Windows 8 PC. All the images captured are saved in JPG picture format. Well, I hope by now you might have got excited about the app to capture images from videos on Windows 8. But, wait a minute as there is something which you will surely not like about this free version of Vid2Pix Windows 8 app. Capturing the images from this free version leaves the watermark of its logo on the image captured. It means when you capture the images from any video via this free Vid2Pix app, it leaves number of watermarks on image. To remove the watermarks on the images, you need to buy the full version of the app and unlock the feature of removing watermark automatically. How To Capture Images From Videos On Windows 8? 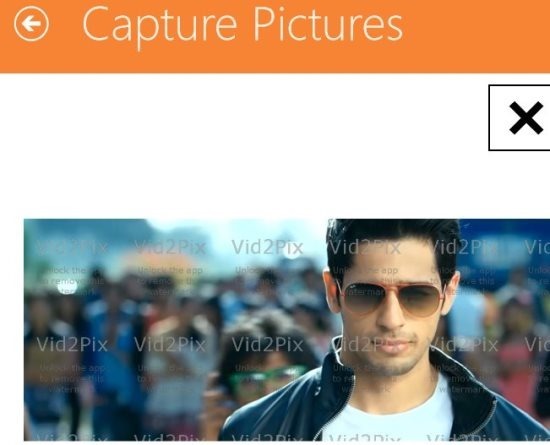 To capture images from videos on Windows 8 via Vid2Pix, you just need to click the “capture pictures” tile in the app. Now, import a video file from your system drive and play the same. To capture the scene or image from video, just click on “capture frame” button, and the app will capture image from video. Now, to go ahead and capture another image from the same video, just click on “next frame” button, and the app will be ready to capture another image. Likewise, you can easily capture multiple images from a video. All the images are saved separately like folders. Images captured from different videos are saved in different folders with the name of the video from which you have captured the images. Capture images from a video. Saved all the images in JPG format. All the images are saved in different folders according to the video from which the images are captured. Supports almost all the video formats supported on Windows 8. Also, check out our posts on Video Player Apps, and YouTube Apps. To download and install Vid2Pix app on your Windows 8 PC, just open the App Store, and search for Vid2Pix app. Else, open the link in IE10 and click ‘View in Windows Store’. Now, click on install button, and your are done with. I truly like this Vid2Pix Windows 8 app as it is a nice app to extract pictures out the videos. I like the fact that all the images captured are saved in one single JPG format. Also, I like the ease to access quality. If you have any other Windows, other than Windows 8, then you can check out our post on software to extract images from videos.